Black on Black crime is when black people overtly focus, criticize, or analyze other black people in areas they wont consider about anyone else. On this page you can download, listen or open a seperate page to play an episode. 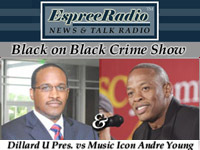 Dillard University President vs Music Mogul Andre Young Dr. Dre, Decoration Day vs Memorial Day, Preview of the Movie Baggage Claim, entertainment updates and more. Join Jerome, Phinesse and Daniel on this program. 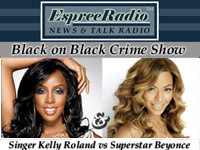 Singer Kelly Rowland vs Music Superstar Beyonce Knowles-Carter, Rapper/Actor Eve Jeffers vs. Black Men/Kanye West, Profile of Legendary Leader El-Hajj Malik El-Shabazz In honor of his 88th Birthday , entertainment updates and more. 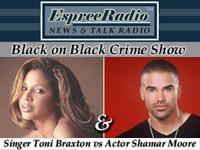 Singer Toni Braxton vs Actor Shemar Moore, Tennis Pros Sloane Stephens vs. Superstar Serena Williams, Black Journalist concerned about whites stereotypes on TV, entertainment updates and more. Join Jerome, Kai, Phinesse and Daniel on this program. 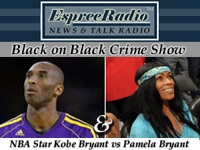 NBA Star Kobe Bryant vs. Pam Bryant (his mother), Black on Black racism: Marketing Mountain Dew vs. Black Consumers and Anatomy of a Hustle author Clinton Galloway vs Black Politics, entertainment updates and more. 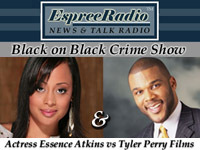 Actress Essence Atkins vs Filmmaker Tyler Perry, NAACP Ben Jealous vs The interest of Black people , Mumia Abu-Jamal Documentary pulled from NJ theatre at the last minute, Vibe Magazine sold, entertainment updates and more. 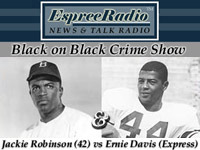 Jackie Robinson 42 and Ernie Davis the express, CNN's News coverage vs CNN's racial bias, Whoopi Goldberg talks about the view and directs comedic legend biopic, Movie Preview of Peeples, entertainment updates and more. 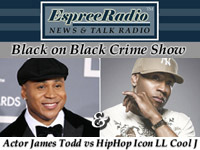 On this Program: Actor James Todd vs Rap Icon LL Cool J with song Accidental Racist, Actress Stacey Dash vs The Carters in Cuba, Jay Z new release open letter preview, Wu Tang is back and Cold Era Thatcher is gone, Black sports movies, entertainment updates and more. Join Jerome, Kai, Phinesse, Daniel and the Commish Cathleen on this program. 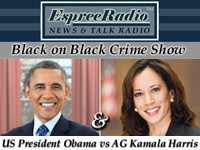 On this program: President Barack Obama vs California Attorney General Kamala Harris, WNBA star Swin Cash vs Baylor's Brittney Griner talk of joining the NBA, Cast changes on Real Husbands of Hollywood, President brain initative, entertainment updates and more. 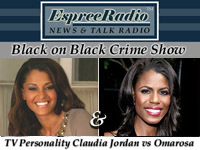 On this Program: Model/Actress/TV Personality Claudia Jordan vs Reality Star Omarosa, Denzel's New Movie 2 guns Preview, Phinesse reviews the movie Temptation, Baisden follow up on Urban Radio shake up, entertainment updates and more. 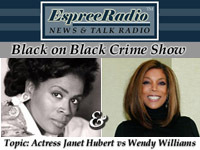 On this Program: Actress Janet Hubert vs Wendy Williams, Jada Pinket Smith poses question: Should black women magazines stay black, Urban Radio shake up with Micheal Basdin, entertainment updates and more. 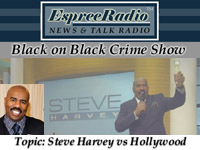 On this Program: Comedian/Actor/Talk Game show Host Steve Harvey vs Hollywood, Black BioPic's Virtues vs Vices What would you like to see at the movies, Oprah responds to Howard, KRS1 song Disaster Kit, entertainment updates and more. 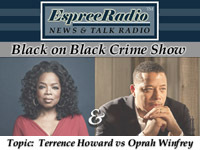 On this program: Actor Terrence Howard vs Media Mogul Oprah Winfrey, Actress/Singer KeKe Palmer vs Social Media, Race Stories: In the News, Jada Rock's youtube preview, entertainment updates and more. 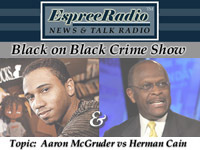 Our Main topic: Cartoonist/Screen Writer Aaron McGruder vs Herman Cain, Singer/Producer Kandi Burruss vs Social Media, CNS High School Performs The Wiz using black students in background, Angela Davis biopic preview, entertainment updates and more. Join Phinesse, Daniel, Cathleen, Dacia and Jerome on this episode. 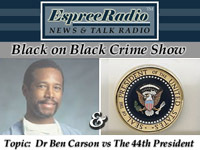 This is a loyal listener main topic: Dr Ben Carson vs The President of the United States, Media Made Stories: Denzel's Friends Comment, Slavery by Another Name update, Wayne Brady May have to choke a...., entertainment updates and more. 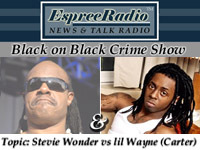 On this program: Music Legend Stevie Wonder vs lil Wayne (Dewayne M Carter Jr), BOBC Black history tv: Slavery by Another Name, The Australin Herman Cain, entertainment updates and more. Join Danial, Jerome and the Commish holds it down with several guest on this episode. 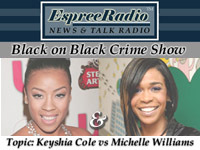 Our topics: Keyshia Cole vs Michelle Williams formerly of Destiny's Child, The controversial Lifetime Movie Betty and Corretta, The cast of Roots blast TerPUNKtino, entertainment updates and more. Lokey, Danial, Jerome and the Commish Cathleen Williams holds it down and have some laughs. 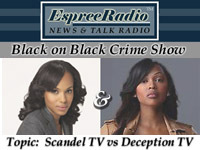 On this program: Scandal vs Deception: are these shows a crime against black men, Joe Jackson comments on spanking your kids, entertainment updates and more. Author Kai Sims with Danial, Jerome and the Commish also have some laughs about the show Real Hollywood Husbands. 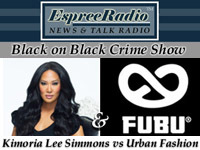 On this program: Kimoria Simmons vs Urban Fashion Designers, Number One POTUS haters West and sidekick Travis have a problem, What's up: News & Entertainment, Real Husbands of Hollywood and much more. 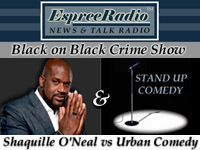 Join Jerome, Danial & the Commish on this show. Black on Black crime is when black people overtly focus, criticize, or analyze other black people in areas they wont consider anyone else. 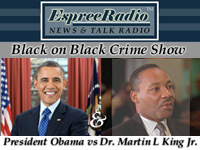 President Obama vs Dr. Martin L King, entertainment updates and Inauguration coverage with Author Kai Sims, Lokey, Karl, Jerome and the Commish. We also have a **Special Report** from DC with GK, Sandy and SoulofSyracuse.com Columnist Alyssa. 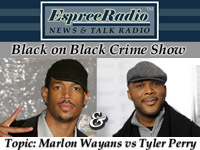 On this program: Marlon Wayans vs Tyler Perry, Megan Good wants to play Whitney Houston in biopic, Django Movie pose-able action figures, news extras and a game of black or white. Join Jerome, Kai, Lokey and the commish on this show. Black on Black crime is when black people overtly focus, criticize, or analyze other black people in areas they wont consider anyone else. 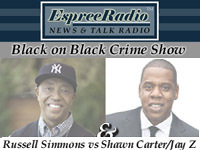 Def Jam Founder Russell Simmons vs Jay Z (Shawn Carter), Smiley/West vs the President with a poverty tour, we preview DJ Jazz Jeff's son's single and a special commentary by Kai. Arts & Entertainment. Join Author/Columnist from soulofsyracuse.com Kai Sims with Jerome on this show. 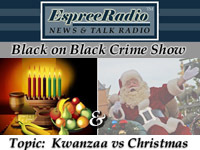 On this episode: Kwanzaa vs Christmas, T-Boz new TLC show preview and comments on CB and RiRi, New Laws, News Extras and more. Black on Black crime is when black people overtly focus, criticize, or analyze other black people in areas they wont consider anyone else. 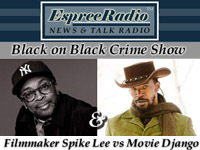 On this Program: Filmmaker Spike Lee vs Movie Django Unchained, Pizzaman Herman Cain vs NY Times op-ed, News Extras and Black holiday classics. 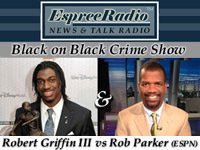 On this program: RG3 vs An ESPN contributer, Harry Belafante makes another presidential comment, News extra's and a special tribute to PE for Rock N Roll hall selection. 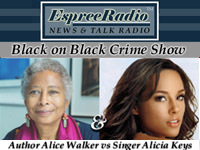 Author/Columnist Kai as co-host with Jerome on this program. 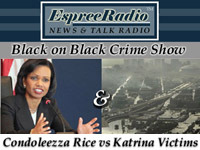 On this program: Condi Rice vs Hurricane Katrina victims, New upcoming TV programs, Crazy Marriage Laws and a game of Black or White. 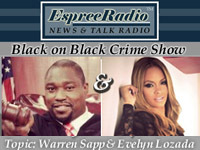 Author/Columnist Kai as co-host this episode with Jerome and special guest Daniel..
On this episode we discuss Warren Sapp statements about the head butting by Chad Johnson and his wife Evelyn. For more shows from the archives feel free to check ITunes or Send us a request and we will create a link.